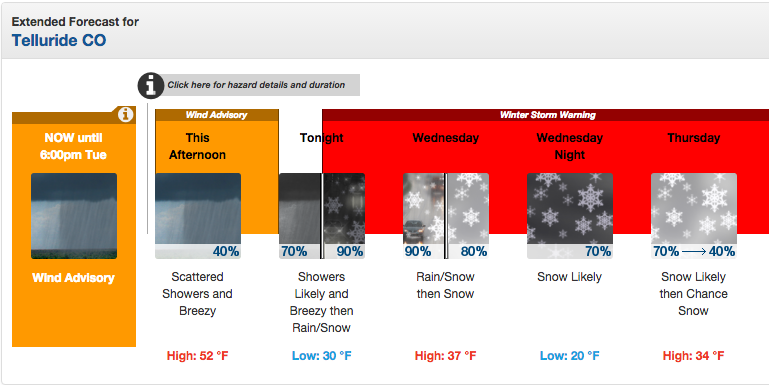 Up to 20 inches Forecasted for the San Juans – Bring It! WEDNESDAY MORNING AND AGAIN ON WEDNESDAY NIGHT. TOTAL SNOWFALL WILL RANGE FROM 15 TO 20 INCHES. * WINDS...SOUTHWEST 15 TO 25 MPH WITH GUSTS UP TO 40 MPH. WILL EXIST OVER THE MOUNTAIN PASSES.